As a general grocery item in our house, bananas are always on hand. Usually we can eat them all before they ripen too much, but last week, we were left with three bananas that needed to be made into something before they went too far. I did not want to make banana bread, so I decided to figure out something new for these sweet, but very ripe, bananas. 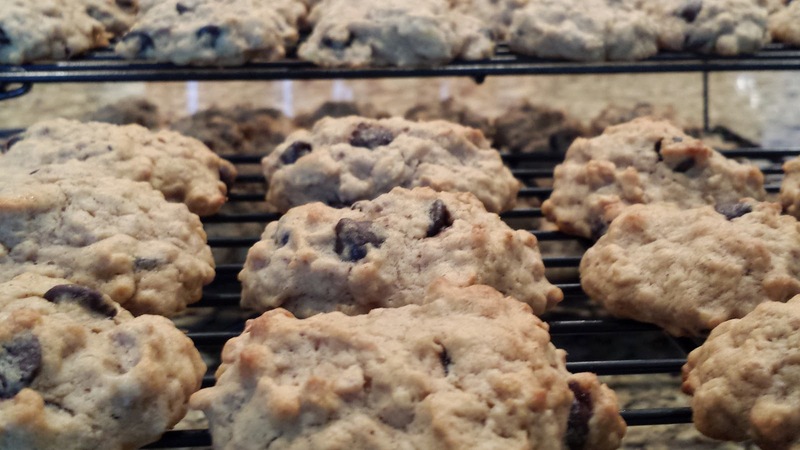 This recipe was developed to satisfy my craving for a cookie but with nutrition in mind. Are these "healthy" cookies? No, not really, but they are healthier than some of their relatives. Another great thing is that they stay moist and soft, making them almost like a tiny cake! Why call them Monkey Treats??? The bananas, of course! 1. In the bowl of a large mixer, cream the butter, shortening and sugar until fluffy. Add the peanut butter and bananas. Mix until completely smooth. Add the eggs and vanilla, mixing until combined. 2. In a separate bowl, combine the dry ingredients. 3. With the mixer on low speed, add the dry ingredients, 1 cup at a time, mixing completely between each addition. 4. Stir the chocolate chips into the batter. 5. Place the 1 tablespoon scoops of batter on an ungreased baking sheet, leaving at least 1 inch between each cookie. 6. Bake in preheated 375 degree oven for 12-15 minutes until lightly brown. 7. Remove from the oven and allow to cool on the pan for 1 minutes. Then immediately remove to a cooling rack. The abundance of zucchini and summer squash in our garden is still overwhelming. This is the longest we have ever had plants to continue to produce; we are blessed this year. However, this also means that I have to find new ways to use the vegetables in order to avoid burnout. While I love our traditional methods, this recipe allowed me to focus on the natural flavors of the squash in a healthier method. Unlike squash casserole, there is no cream or large amounts of cheese in this recipe.....although I do enjoy squash casserole! I also threw in some jalapenos for a little spice, and, in full disclosure, I needed to use up some of the dozens of jalapenos coming from our garden. Try this recipe. You will be pleasantly surprised! 1. Toss the squash, zucchini, oil, garlic, and jalapenos in a large bowl. 2. Stack the slices tightly in a casserole dish. Pour any residual oil and jalapeno or garlic over the slices. 3. 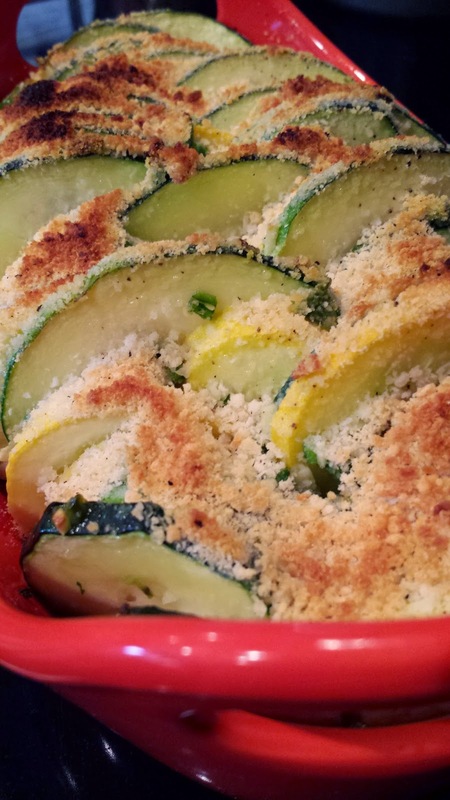 In a small bowl, combine the breadcrumbs, cheese, salt and pepper. 4. Liberally cover the top of the slices with the breadcrumb mixture. 5. Tightly cover with foil and bake at 350 degrees for 90 minutes. 6. Remove the foil and bake for an additional 10 minutes, or until the top is golden. Follow Amee Winters's board Modern Southern Cook on Pinterest.